Listen to "102 Minutes" on your iOS and Android device. The book started a bit slowly, and the jumps between characters was a bit hard to follow. But this is a unique perspective on the horrific attack our country suffered in 2001. It is fascinating to hear how a chance decision by some determined whether they lived or died. Well told. What was I thinking? I was in a blue funk for days. Narrator did a great job with a difficult subject. This story is told in a remarkable way. It does not sensationalize or rehash what the main stream media has reported over the years. What an intense and insightful view of this tragedy. Very intense and captivating book. Kept my attention 100% and very easy to follow. It was very fact based and still told the stories of some of the heroes of 9/11. Highly recommended. Touching, heartwarming, factual, a must listen to if you feel you are losing sight on the fact that our wonderful country is made up of beautiful people still who will give their lives to help others. Although this book made me cry I still feel everyone should listen to it. I don't normally take the time to write reviews, but I was awed by this book. 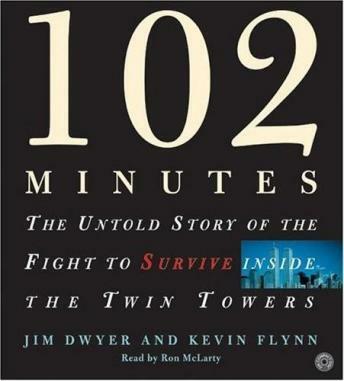 The authors do a fabulous job of relating thoughts and perspectives of the people in the Twin Towers on 9/11. I can only imagine the desperation and fear and will never truly understand it since I didn't go through the tragedy myself. But every American should listen to this book to gain an appreciation of the unintentional heroes of that day! A truly heartbreaking 102 minutes. Such a tragedy is hard to fathom. I think this account helps us to realize the horror these people had to go thru. May God bless their families. Very well done. Interesting without being sensationalistic. Does not "cash in" on this tragedy, but does make it personal.